Between culture and scenery, for an unforgettable stay! The beautiful town of Loreto, in the heart of the Marche countryside a few miles from the B & B Montegallo, owes its fame to the sanctuary where it is preserved and venerated the Holy House of the Virgin Mary. This is a holy place, that the same Pope John Paul II has described as “true Marian heart of Christendom”. The sanctuary has been for hundreds of years, and still is, one of the most interesting places of pilgrimage in the Catholic Christian world . Throughout history has been visited by popes, by hundreds of saints and blessed, and by millions of pilgrims from around the world each year. Archaeological and historical research have recently shown, in support of an ancient tradition, the Holy House is just the birthplace of Mary, once located in Nazareth, where he originally lived and received the Announcement Evangelical. The stones that made up the walls of the house, located in a cave carved into the rock – still venerated in Palestinian territory – were transported to Loreto by ship by soldiers crusaders. From the second half of 1400 in Loreto, given the multitude of pilgrims visiting the holy relic, they began to build the magnificent sanctuary, with the competition in the years of illustrious artists and architects like Giuliano da Majano, Bramante, Sansovino, Vanvitelli, Bandinelli, Melozzo da Forlì, Signorelli – to name a few. It ‘also important to remember the pilgrimage Macerata-Loreto since 1978, the year of its establishment in conjunction with the election of Pope John Paul II, sees tens of thousands of pilgrims arrive on foot to the shrine from Macerata. Loreto is also a wonderful village which houses masterpieces of architecture, sculpture and painting as the paintings by Lorenzo Lotto kept in the “Ancient Treasure of the Holy House” Museum. 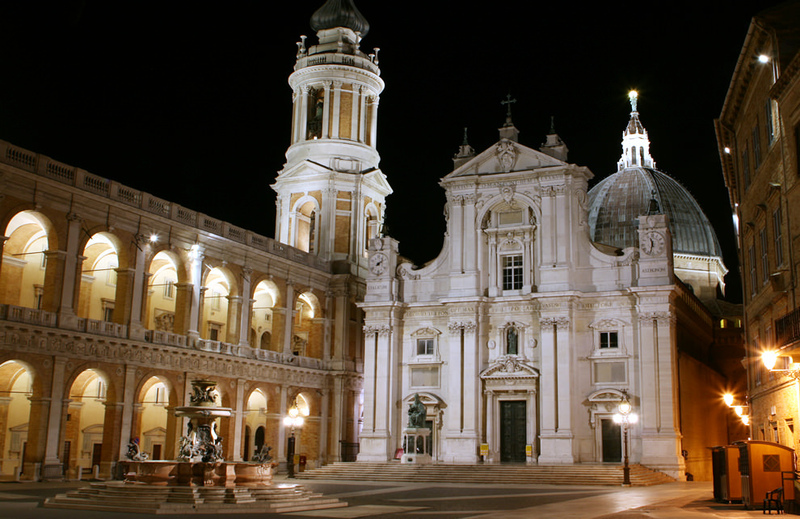 Loreto, a city of art, to discover! Would you like to spend your holidays in Loreto, between religion and art? Choose our hotel, book now for a truly unforgettable!